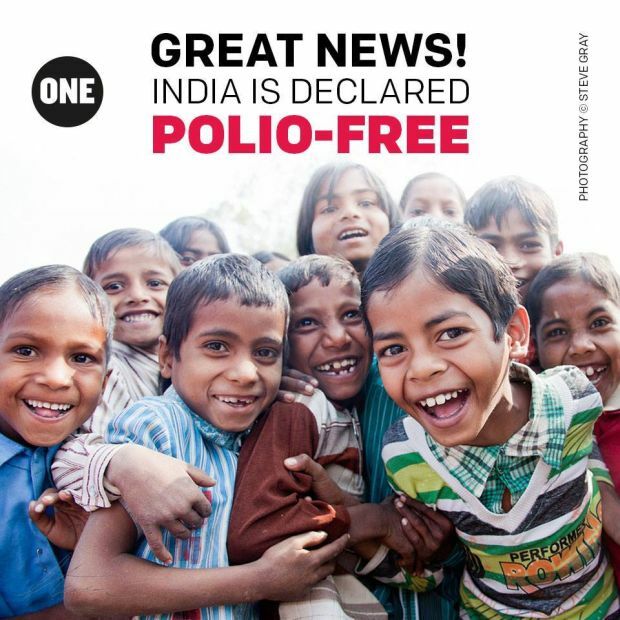 Photo: Poster of Polio-free India. Polio eradication program is one of the recent successful achievements of Health organisations across many countries including India. The last case of polio was diagnosed in India in January 2011. After maintaining a polio status for a couple of years an independent panel of 11 experts from the South-East Asia Regional Certification Commission for Polio Eradication (SEA-RCCPE) met for two days and reviewed evidence from 11 countries including India. 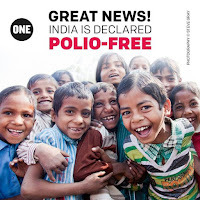 Subsequently, India was declared as a Polio free country. There are a couple of anticipated problems in all countries currently titled "Polio free". First, Vaccine strains and vaccine derived strains (Reverting mutants) are expected to circulate and hence vaccination has to be continued. Second, there are still regions where polio has not been eradicated and hence strains from these regions can possibly spill and bring back the infection again. Let us have a look at both. Table 1: Salk vs Sabin Vaccine for Polio. Oral polio vaccine contains attenuated virus, capable of activating an immune response in the body. Being a live virus, the strains replicate in the intestine. During this time, the vaccine strain is also excreted. This excreted strain spreads in the local community which can further help in building herd immunity. OPV provides systemic and mucosal immunity for an individual and also intensifies herd immunity it is the preferred vaccine for vaccinating the masses at risk. However, there are rare events where the excreted virus mutates and reverts to its virulent form. These are known as known as a circulating vaccine-derived poliovirus (cVDPV).When a sufficient number of people are immunised by OPV there rare possible event of reverting mutant becomes a significant risk and hence switching to IPV (Injectable polio vaccine, Dead strain) is more useful. This also ensures that immunity continues to be kept against a very rare possible case of vaccine derived polio. Since 2000, more than 10 billion doses of OPV have been administered to nearly 3 billion children worldwide. As a result, more than 13 million cases of polio have been prevented, and the disease has been reduced by more than 99%. During that time, 24 cVDPV outbreaks occurred in 21 countries, resulting in fewer than 760 VDPV cases. One of the best discussed cases of lack of vaccination is that of Pakistan. Pakistan has still a good number of unvaccinated people against polio. Despite heroic attempts by the workers to vaccinate there has been fierce resistance. On 20 April 2016, polio workers and the police guards were shot dead in Karachi. Polio workers in Pakistan are often targeted by militant groups due to several misconceptions. Events such as these make polio vaccination has been a huge challenge in Pakistan. In 2015, Pakistan reported 54 of 74 worldwide cases of polio. The implication being that Pakistan is geographically near to India and spillover of the virus can happen at any time if sufficient vaccination has not been done. That is a good background to start talking about the implications of finding a circulating polio strain in Hyderabad making headlines everywhere. 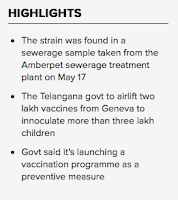 In a routine survey, Vaccine derived polio virus type-II (P2) was found in the lab tests conducted on samples of sewerage water collected at Amberpet in Telangana. Similar situations have been reported earlier in other countries, but this is a first in India after achieving polio-free status. As I already mentioned previously, very rarely VDPV cases do occur. As a preventive measure, the government has decided to vaccinate more than three lakh children in Hyderabad and Ranga Reddy district as a preventive measure. Rajeshwar Tiwari, principal secretary, health states "The government has decided to conduct a special campaign against polio in Hyderabad and parts of Ranga Reddy from June 20 to June 26." The finding that circulating Poliovirus could be seen indicates that virus can be seen in a community even after immunisation. However, vaccination ensures that people are protected by neutralising antibodies. Countries like US have switched to IPV and doesn't survey for Polio strains in the environment. Experts suggest that circulating strains are unavoidable as long as OPV is in use and not all countries are yet ready to switch to IPV. Multiple publications have indicated that immunisation with IPV will not lead to the eradication of wild-type poliovirus. In order to achieve complete eradication OPV should continue till every country is polio case free then switch to IPV. How long should the IPV be in use is not a question that can be answered currently. India switching to IPV is currently not a good idea since our geographical neighbour is not yet polio free. In short, finding some Polio strains in environmental samples is not a new deal and there is nothing fancy about it. But it does suggest that we cannot yet let our guard down and must continue vaccination for at least a few more years. I strongly recommend readers to read Vincent's blog post on Implications of finding poliovirus in sewers. Similar principles apply to our current scenario.